We are really excited about our new mini wedding cake collection. 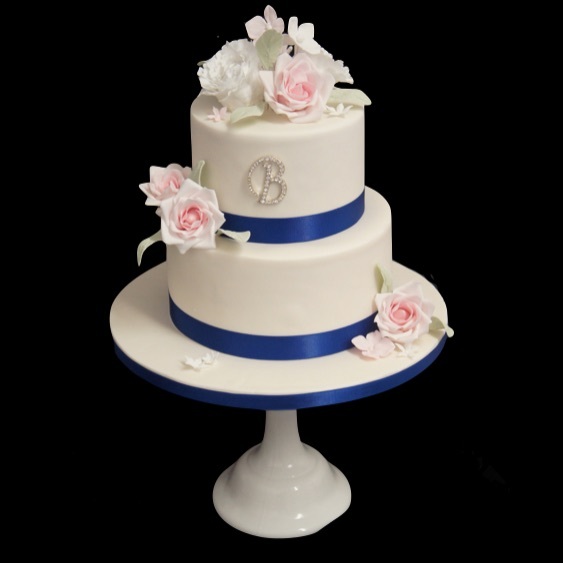 Our mini wedding cakes are sized 4″, 6″ and 8″ serving approximately 70 portions. 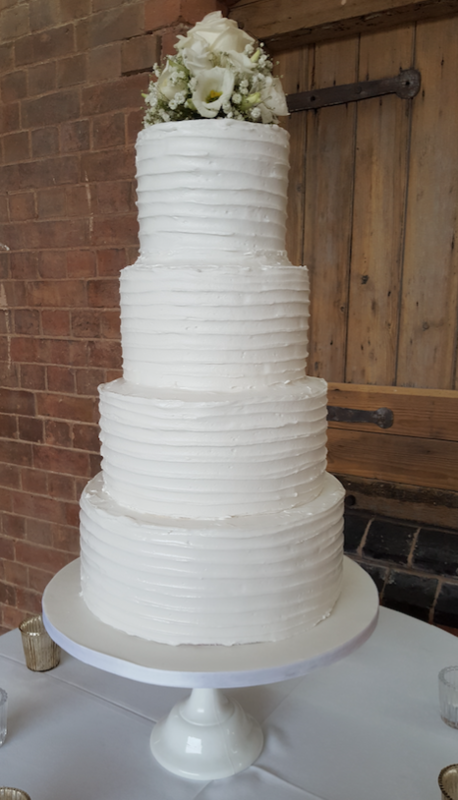 Our mini wedding cakes are ideally suited for smaller wedding receptions and are also available in 3″, 4″ and 5″ depth, although, a combination of depth really makes these wedding cakes elegant. 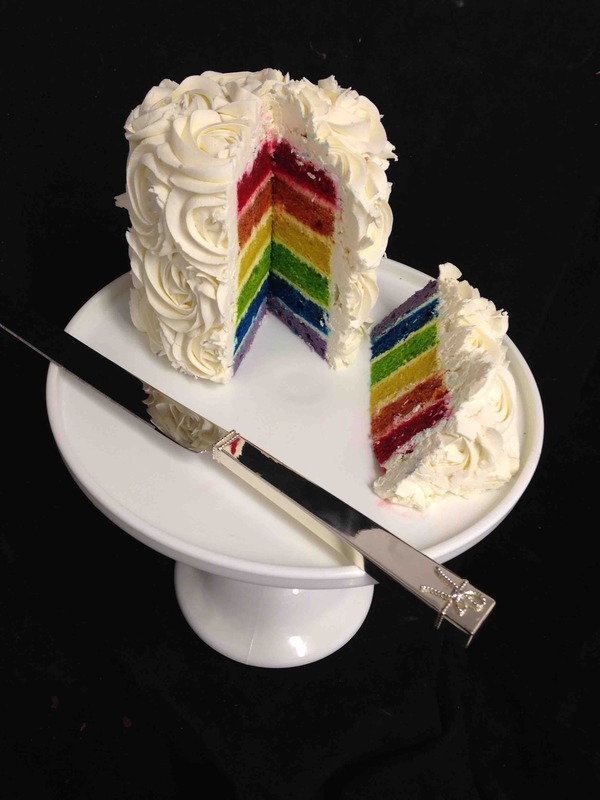 Our new coloured and patterned cake flavour designs are also available for our mini wedding cake collection. You can choose from hearts, stars polka dot, just to name a few to our delicious mouth watering rainbow cake flavour design. You can also choose different cake flavours for each tier and our mini wedding cake collection is available in our range of delicious cake flavours, as well as, our eggless and gluten free flavours. We are really excited to be exhibiting our new collection of wedding cakes on 18th January 2015, at the National Asian Wedding Show, Birmingham Motorcycle Museum. 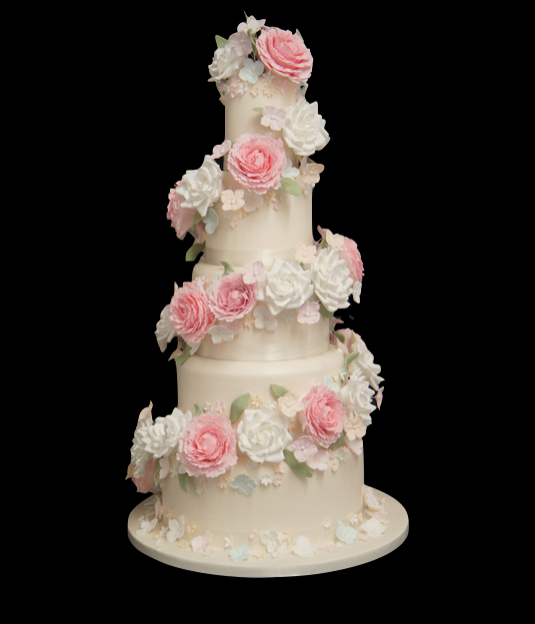 One of our latest wedding cake designs is our beautiful swirling rose wedding cake. 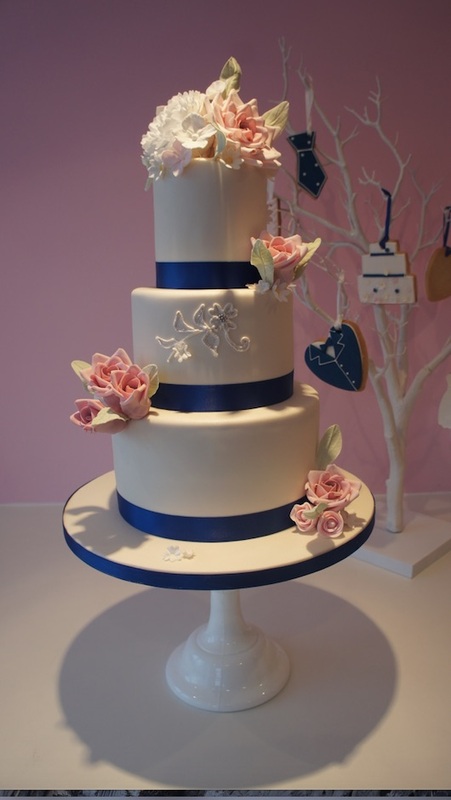 Each flower has been individually made from sugar and this 5 tier cake really is eye catching. You can also choose a different flavour for each tier, you can choose from over 36 of our delicious range of cake recipes. Following the success of our series of shows in 2014, where over 44,000 people visited 5 shows in 3 cities, Europe’s largest Asian Wedding Show now returns to the Midlands. The National Asian Wedding Show has built a solid foundation over the 9 years it has been teaming brides and grooms to be with world class exhibitors across the UK. The show builds on its success by delivering great number of visitors. 2015 is set to raise the bar once again in the industry with the National Asian Wedding Show starting off the year at The National Motorcycle Museum in January, then returning to The Bradford Hotel before finishing off the season back in London’s prestigious Radisson Blu Portman Square at the start of March and at The City Pavilion at the end of March. Sticking to the big day budget can be exhausting and difficult and in this months Your West Midlands Wedding magazine we were asked to answer the big question in the Hot Topic experts advice section. Q . My fiance and I are working to a tight budget with our catering, so would like to serve our wedding cake as the desert. We want it to look and taste like a final course though, rather than a plain piece of cake. What might fit the bill? Your wedding cake designer should be able to recommend a number of different flavours, some of which are more suitable for a dessert than others. You could try a rich chocolate cake served with fresh strawberries and a scoop of vanilla ice cream, or perhaps a refreshing lemon curd cake served with raspberry coulis and a drizzle of fresh cream. Whatever you decide, remember the cake will need to be taken away well in advance of the dessert for the caterers to cut up into pieces. This might mean your cake will only be on show at the reception for a short amount of time, so you might want to consider having a smaller or fake cake for display purposes only, with the cutting cakes or cakes in the kitchen. Another lovely option is to have individual cakes on each table. A 10 inch cake beautifully decorated with flowers could work well as an alternative centre piece. When the time comes for dessert, the caterers could then bring bowls of strawberries and jugs of cream to go with the cake. 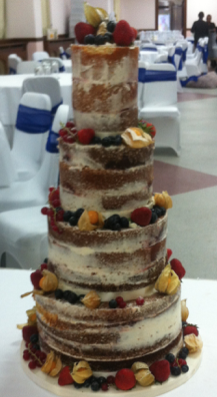 Well, the wedding season is in full swing and we are extremely busy creating some fantastic wedding cakes for this week. 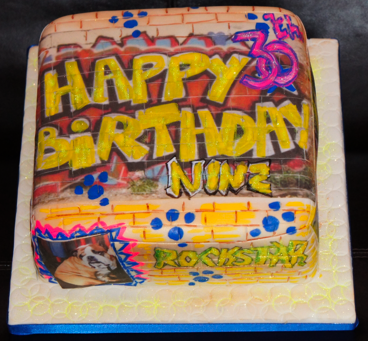 We always love creating new designs but one of our most favorite and fun cake designs is our renowned wedding graffiti cake. The cake is so inspirational and such a talking point at any occasion as the whole cake is completely personalised to the clients own tastes. This week is no exception with us being asked by one of our London interior designer clients to create a Birthday Graffiti Cake with our delicious Red Velvet Cake Recipe. I am sure you will agree the cake just looks fantastic and will surely be a talking point, especially when the guests see and taste our wonderful red velvet sponge cake. We have just added a new Cake Flavour to our deliciously moist Cake Flavour List. Our new Red Velvet Cake recipe is a cake that can stop traffic and has quickly become one of our most popular cake flavours. The sponge is a beautiful deep red. The colour becomes even more eye-catching set against layers of ivory butter cream and icing. The cake flavour is a mixture of chocolate and vanilla and our customers are just loving it! 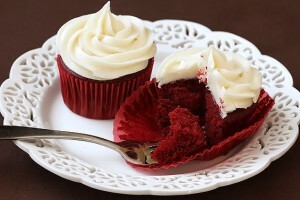 Our Red Velvet cake is a definite surprise and talking point for all your guests and at any special celebration! Red Velvet Cake is not commonly found among cake bakers and designers in the UK as it tends to be a difficult sponge to get right – Here at SugarBliss Cake Company we have taken much time and patience to get the flavour and the colour to both taste and look fantastic and is now available to all our customers.